When the “standard size” garden shed won’t do, the Yardpro® "Eco Plus" range, 1510 and 2010 models are where it’s at! This range of buildings leverages the simplicity and economy of the renowned FASTTRAK® assembly system. The ideal solution for an affordable workshop when you don’t need the extra strength of a portal steel framed building (Yardpro® 260 series & 360 series). 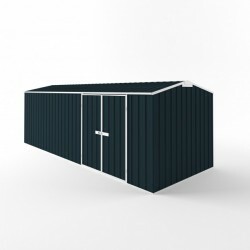 The range comes standard with 2 wide openings, a double door and extra wide single door which means you can divide the space if you want to combine a dedicated workspace with a big storage shed.